Best 6.5 Creedmoor Barrels of 2019 – Heavy, Short, For The Money, & More! Finding the best 6.5 Creedmoor Barrel doesn't have to be a challenge. But it can be if you're sifting through many different options and have no idea which one is best for your personal needs and preferences. It is important to find the best barrel for your rifle to ensure that you are getting the most out of your 6.5 Creedmoor barrel. You have a rifle that is designed to hit targets at long range. An upgraded barrel will ensure that your accuracy and precision will be much better when compared to using factory or stock barrels. Today, we'll be taking a look at ten of the best 6.5 Creedmoor barrels currently on the market. 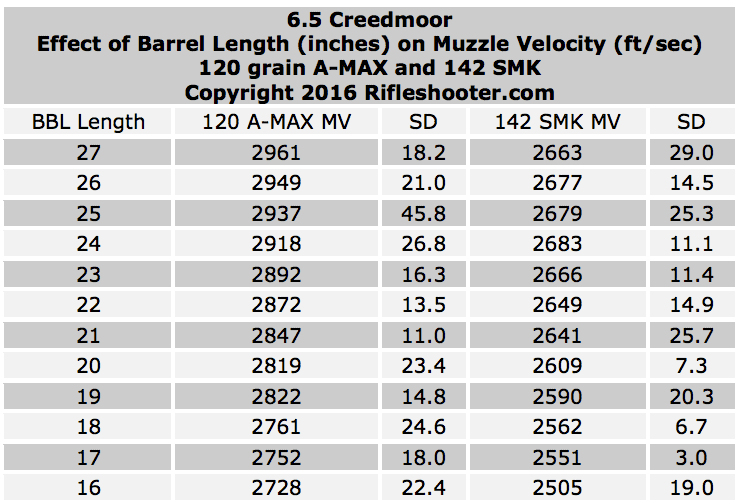 So what is the ideal length of a Creedmoor barrel? How does it affect bullet drop or wind drift? These are a few common questions that are asked among buyers. The length of the barrel will affect the velocity as well. Currently, the shortest Creedmoor barrel is measured at around 16 inches. Meanwhile, the longest barrel is measured at approximately 27 inches. While there is no definite answer to the question of ideal length, a 24-inch barrel will be a good compromise on the longer end, while a 22-inch won't leave you much. As for how it affects bullet drop and wind drift, let’s take a look at the Hornady 120 grain A-Max cartridge. These rounds were shot inside 800 yards, both out of 27-inch and 24-inch barrels respectively. There is a little velocity lost while the barrels change. At 1,000 yards, 0.3 mils of elevation and 0.1 mils of drift is sacrificed. Keep in mind that this also depends on the type of Creedmoor rounds you use. What Makes a Great Creedmoor Barrel? This is a question you'll need to ask while you're looking for a Creedmoor barrel of your own. It will allow you to distinguish which barrel is excellent in quality compared to the models that are considerably cheap not just in price, but also in quality. A great barrel is always strong and is able to sustain as many rounds as possible during its lifespan. You want a barrel that will still function without issue after firing off many rounds. It’s also important to find a material that will allow for easy cleaning every time you clean your rifle. Unless you have gunsmithing skills, it is important to find a barrel that won’t take a lot of time, headaches, or money for the installation alone. Some of the Creedmoor barrels may need to be installed by a professional gunsmith. If you do not wish to go down that route, find a barrel that requires little to no gunsmithing skills. A great barrel should give you the best accuracy possible for your Creedmoor rifle. Since it is designed to be a long range rifle, nothing is more thrilling than hitting a target dead on from far away. A great barrel will enhance your rifle’s accuracy like no other. So, pay attention to what the reviewers are saying about their shot groups each time you do a little deep digging on the barrel that interests you the most. Very durable and can take a serious beating. Barrel is sub-MOA with most Creedmoor rounds. One reviewer complained about the barrel leaving an empty casing sitting on top of the magazine. This was likely due to a faulty spring. First, we have the PSA 20” Stainless Steel Barrel & BCG Combo from Palmetto State Armory. PSA is typically one of the more familiar brands among gun owners. It doesn’t matter if you own a 1911 or a Creedmoor rifle, you’ve probably relied on a PSA once before. If not, it may be worth checking them out. 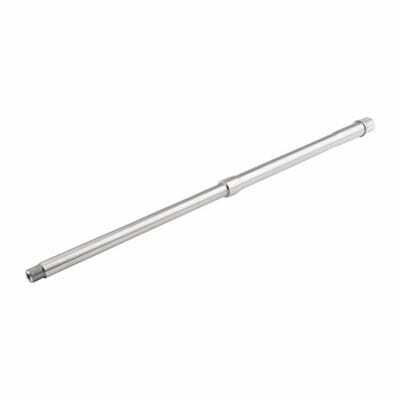 This barrel is measured at 20 inches and has a stainless steel finish. 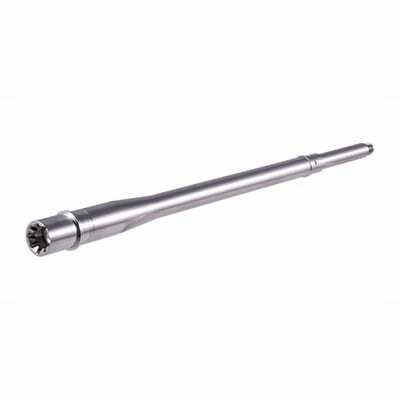 This barrel is crafted from 9310, nitride-coated steel. So you’re getting a sturdy barrel that will make sure that each shot is accurate and does not give you any issues after firing off many rounds. If you’re looking for an upgrade that is considered the best of the best on the market, you might consider the PSA brand as a possible choice. This is an excellent upgrade compared to your standard stock or factory Creedmoor barrel. The PSA is currently considered to be the best on the market and we agree that it has performed well enough for that honor. With its steel construction and finish, this barrel should be able to last you for a long time. So, if you're looking for a barrel that might possibly be the last one you'll buy in quite a while, consider the PSA as your barrel of choice. Holds .75” groups at 100 yards. Performs less than MOA with most factory Creedmoor rounds. One reviewer complained about a burr on the crown. Next on the docket, we have the premium barrels from Brownells. 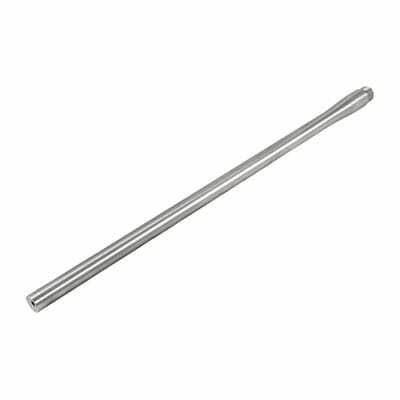 These barrels feature 5R button rifling and are machined from 416R gun barrel steel, making them very superior shooting barrels. This 6.5 barrel features a stainless steel finish. It has a 1:8 twist for excellent performance with a wide range of cartridges, including Creedmoor, and are available in two lengths: 18 inches and 24 inches. The 18-inch barrel features a mid-length gas system. The 24-inch barrel has a rifle length system. The muzzle is threaded ⅝"-24 and the gas shoulder accepts a 0.750" gas block. The opposite side of the gas port features a dimple for a gas block set screw. A 6.5 bolt is included with each barrel. This is crafted from 9310 steel with a bolt face depth of .136". The barrel extension is an M4 feed ramp style. Brownells has proven itself to be a decent brand. And this barrel is pretty good for the money. After all, if there’s one thing that Brownells is known for, it’s making quality gun parts at affordable prices. If you’re looking for a barrel (be it 18 inches or 24 inches) that will give you excellent accuracy and performs sub MOA at a good distance, this is the barrel you should consider for further review. Works with most 6.5 Creedmoor rounds. Excellent performance, thanks to the 1:8 twist. Can help you hit targets dead on at 1,000 yards. If you're on a budget and you're not sure which barrel is the right choice for your Creedmoor rifle, then we've got good news for you. You can get a pretty good Creedmoor barrel from none other than one of the best brands on the market today. Wilson Combat is one of the most reliable and most popular brands on the market for all the right reasons. They make high-quality gun parts and will offer them at budget prices. This is no joke. They have built a positive reputation on creating gun parts so good, users think they're stealing with the price they pay. In the world of long range shooting, the Creedmoor rifle is taking its place as the king of long-range shooting rifles. This is a rifle of choice among competitive shooters, hunters, and target shooters alike, all of whom are looking for advantages at every distance. The Wilson Combat is the kind of barrel that will give you those increased capabilities. Each match-grade barrel from Wilson Combat is machined from 416R stainless steel. This barrel features several elements that are optimized for long-range performance. It is optimized for longer, heavier weight projectiles that are used to push the limits of the Creedmoor rounds. You’re unlikely to find a better performing barrel quite like the Wilson Combat. Even better, it is available at a price that most budget conscious Creedmoor rifle owners can afford. If you're looking for an excellent barrel that is not only super strong but deadly accurate, then you would be insane not to give Wilson Combat a deeper look. If you're a target shooter or a competitive shooter, this is the barrel you want to give yourself an even better advantage at hitting distant targets. Excellent performance thanks to the 1:8 twist. Shoots right at 1 MOA with most Creedmoor cartridges. Up next, we have the Faxon Firearms Barrel. This is the best heavy profile barrel currently on the market. The straight flutes give Faxon’s 6.5 heavy fluted barrel a classic target rifle look. The 5R button rifling inside this barrel makes the most of the Creedmoor round’s accuracy potential. Unlike traditional rifling, the lands and grooves are offset with 5R rifling. This prevents bullet distortion as it travels down the bore. The FF is manufactured from high-grade 416R stainless steel. Each barrel is manufactured at the Faxon Firearms headquarters in Cincinnati, Ohio, which means you’ll be getting an excellent barrel in terms of quality. For that matter, every barrel is made in the USA and adheres to strict quality standards. This barrel is nitride-coated inside and out to ensure that it is resistant to corrosion and surface wear. The FF is available in two lengths: 18 inches and 20 inches. An FF barrel always goes through a series of tests during the manufacturing process. No barrel goes on sale if it doesn’t pass their rigorous tests with flying colors. This goes to show that FF is working to become one of the most trusted brands on the market. And in turn, they’re attempting to produce the best quality barrels possible. If you want a brand you can trust and one that keeps their customers in mind with every barrel they make, you should consider the FF as your potential choice. The FF is quickly becoming one of the most trusted brands among Creedmoor rifle enthusiasts. You can never discount a gun company that always tests their gun parts before they're sold on the market. This guarantees their customers that when it comes to purchasing the FF brand, they'll always get a high-quality barrel. Aside from being excellent in quality, they aim for excellence in overall performance. If you're looking for a barrel for your rifle from a brand that is on the upswing and looking to make a name over the next few years, the Faxon Firearm will be the best option for you. Finish is very aesthetically pleasing. One user was happy to see the barrel help increase the velocity of their rounds. Installation may be a bit of a challenge, depending on the Creedmoor rifle you have. Next, we’ll be looking at the best short profile barrel on the market. This barrel is also from the Faxon Firearms brand. 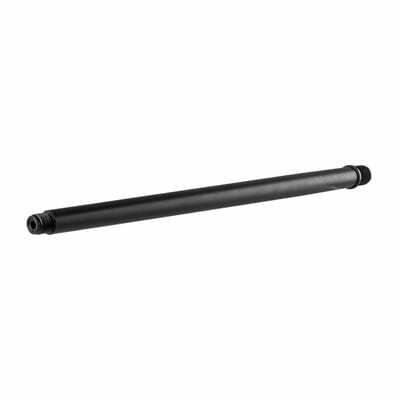 The Faxon Big Gunner Creedmoor rifle barrel offers an excellent balance of maneuverable weight and accuracy potential. 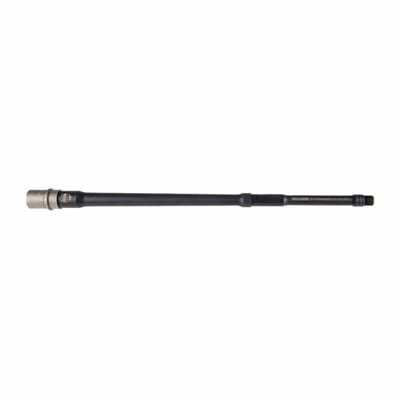 Faxon Firearms always machines their Big Gunner barrels from triple stress-relieved 416R stainless steel and finishes it with a tough, wear-resistant matte black QPQ Nitride finish. The Big Gunner’s barrel profile is a blend of FF’s government and pencil profiles. It matches the government taper from the extension to the gas block and matches the pencil profile from the block to the muzzle. Removing the weight from the front mitigates the muzzle whip, while keeping material at the rear ensures maximum rigidity and resistance to heat distortion. This keeps the center of gravity to the rear, making the rifle much more maneuverable. It’s important to know that Faxon always tests their products prior to selling them to their customers. You’re guaranteed to get one of the toughest, if not most indestructible barrel on the market. If you’re looking for a short profile barrel that gives you that excellent combo of a government barrel and a pencil barrel, you’d be hard pressed to find something just as good as the Big Gunner. Gives .25” groups at 200 yards. Still functions properly after 60+ rounds. Perfect barrel for those who use their Creedmoor rifles for tactical purposes. The price tag is quite hefty, so it’s not an ideal choice for budget rifle owners. Next up, we look at the best AR barrel on the market for the Creedmoor rifle. The BSF 6.5 carbon fiber barrel has a match-grade 416R stainless steel inner core that is sleeved in roll-wrapped carbon fiber that ensures superior rigidity, weight savings, and excellent cooling. This barrel is three times stronger than steel, which means that you’re going to deal with one tough customer of a barrel. That’s because the carbon fiber sleeve creates an air pocket between the barrel and carbon. This allows air to flow around the stainless steel inner barrel and enhances the cooling process. The vent holes in the carbon fiber sleeves let the internal heat escape, which expedites barrel cooling even more. This barrel will stay cool for so long, you can be able to hold it in your hand even after extended shooting sessions. We're not kidding. Fire off 60 rounds with this puppy in one go and this will stay cool enough to touch. The BSF thus far has proven itself to be the best of the best in terms of strength. One of the major features that stands out is that it has the ability to cool off after many consecutive rounds fired. There’s no doubt that this might be the only barrel on the market that has this ability. This is a feature that sounds unheard of. But we won’t be surprised if we see barrels like this pop up over the next few years. But for now, nothing can touch the BSF in terms of this unique feature. Shoots groups as small as ⅝”. Shoots .750” groups very well at 100 yards. One user complained about the bolt nose counterbore being a little undersized. For the next barrel, we look at the best one in the Remington 700 category. This is designed to upgrade the performance of your Remington 700 rifles without the costly stock work. This is a match-grade, short-chambered barrel that has the correct contour top drop into a Remington factory rifle or aftermarket stocks with little to no modifications necessary. You can install this barrel with your factory recoil lug. The muzzle is cut at 90 degrees to the bore and ready for crowning. After the installation, you can use a hand-turned finish reamer to deepen the chamber until the correct headspace is reached. For a barrel, the Shilen is a great barrel upgrade compared to your standard or factory barrel. This is also an excellent barrel to install on your Creedmoor rifle if you hold accuracy to a high standard. The shot groups at close and long range distances can be outstanding if you choose the right barrel. The Shilen has that potential. So, if you’re looking to make your rifle a little more accurate, get this barrel. Very strong for a 24-inch barrel. Dime-sized groups at 200 yards. Accurate in the harshest of weather conditions. If you own a Tikka T3x and need to upgrade to a 24-inch barrel that is best compatible with this kind of rifle, then the barrel from Proof Research might be the best option for you. This is a barrel that provides Creedmoor rifle owners a long list of enhanced features over traditional barrel styles. This is a long range barrel that provides the ultimate accuracy and maintains their performance in even the harshest of conditions. 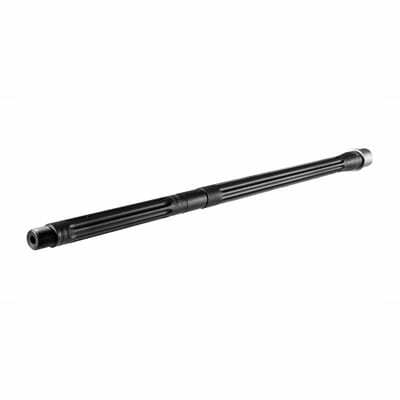 This barrel uses Proof Research’s patented CamGas system, which is designed to reduce the speed of the bolt carrier and improves the overall function and reliability of almost all Creedmoor rifles. This is cut rifled from double stressed relieved 416R stainless steel and features a threaded muzzle with a ⅝ x24 TPI thread pitch for additional muzzle accessories. There might be no other barrel on the market that has the perfect compatibility with the Tikka T3x like the Proof Research barrel. This provides excellent shot groups at long distances. Plus, this is a tough barrel and manages to stay accurate regardless of whatever nature throws at you. If you’re looking for the all-weather barrel for your Creedmoor rifle, then get the Proof Research. If you own a Savage Axis and want a heavy profile barrel, then the Ruger Precision Rifle Barrel might be the one you’re looking for. This barrel is made with an unprecedented level of quality and attention to detail. This provides owners of precision rifles with a high-quality drop-in replacement barrel for their rifles. This barrel is constructed in the USA by American craftsmen using 416-R certified stainless steel and is finished with a heavy duty taper from the chamber to the muzzle for the best harmonics. 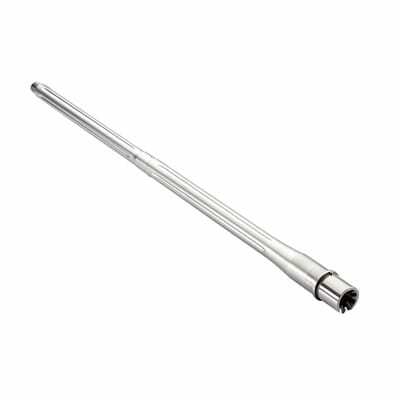 Finally, this heavy profile barrel is nitride-treated to ensure that it is resistant to corrosion, rust, and even wear and tear. It is also machined to accept factory bolts. 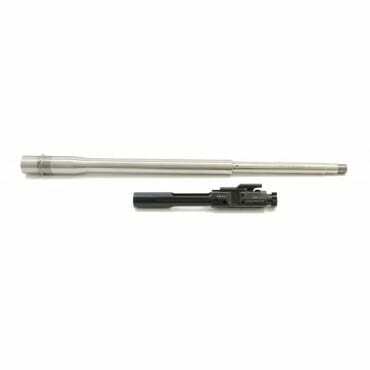 Whether you own a Savage Axis or a Ruger Creedmoor rifle, then you’ll want this heavy profile barrel as your own. A corrosion resistant barrel is great to have, as it is considered to be one of the longest lasting types of barrels there is. Coupled with steel construction, this is capable of sustaining a large number of rounds over time. If you’re looking for a long-lasting barrel for your rifle with added accuracy, then get the Ruger Precision Rifle Barrel. ½ inch groups at 100+ yards. Works well with most Creedmoor loads. Excellent accuracy hitting targets at 1000 yards out. Not an easy installation. You may need a professional gunsmith to install it for you. For our final barrel, we'll be taking a look at the Criterion Barrels Hybrid Barrel. This barrel offers an ideal configuration for those seeking the best accuracy without the added weight of a heavy barrel. This features a flatter trajectory and higher ballistic coefficient than the traditional .308 Winchester alternative. This barrel is designed to be compatible with a variety of pattern rifles. The CB is button rifled and hand lapped to ensure consistent bore uniformity. Prior to installation, headspace should be checked by a professional gunsmith. 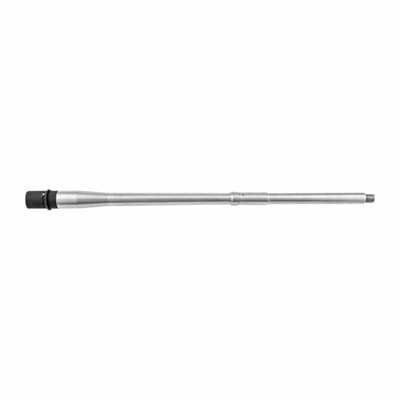 This barrel has a twist of 1:8 for excellent performance and is finished with stainless steel to ensure the best in durability. It is also available in two lengths: 18 inches and 22 inches. No matter which barrel length you use, this one will perform well in terms of accuracy and velocity. If you’re a long range shooter looking for a barrel that will help you hit those long range shots at the range or during a competition, you’ll want a barrel like the CB. You can consider this your multi-purpose barrel. Hunting, target practicing, competitions… it doesn’t matter. You’ll get the satisfaction of a more accurate Creedmoor rifle with a barrel like this. As mentioned before, the Creedmoor is a top contender in being the top gun in terms of long-range shooting. Long-range shooting and accuracy is no doubt an impressive feat. Not only is it the rounds or the gun itself that is important to accuracy and precision, but also the barrel. Upgrading your barrel will improve your accuracy considerably. While it’s recommended after every use, you need to clean your rifle on a regular basis. It is important to find a barrel that is easy to clean so you are able to get rid of all the dirt and gunk that might build up over time. Neglecting to clean your barrel may shorten its lifespan and in turn, might affect the rifle’s overall performance. Another excellent benefit is letting your rounds travel smoothly during each shot. A stock or factory barrel won't do you any favors as a Creedmoor cartridge travels through it. This will likely reduce the velocity of your shots. An upgraded barrel will help not only improve the accuracy of your shots but will also improve its velocity. Finding the best 6.5 Creedmoor barrel is an easy task if you know what to look for. Once you find a barrel that sticks out, be sure to do some deep research to determine whether or not it is a great investment for you. Take into account what people are saying about your barrel of choice online and take each positive and negative thing with a grain of salt. Before you know it, you’ll find a barrel that will fit you perfectly and last you a long time.